As one long hot summer takes its leave, we usher in a busy fall season of cool ocean breezes here in Miami. Tomorrow night, it’s Michael’s Genuine Food & Drink’s turn behind the Raleigh Hotel’s Martini Bar and bartender Brittney Daniels is heating things up at Martini Culture, conjuring up cocktails that speak to an endless summer we don’t want to let go of. At least not yet. The two martinis Brittney is presenting tomorrow night are true to form. From stays in Atlanta to Hawaii to LA, she arrived to Miami in 2005 at age 18 and first worked at a dive bar called Porter House. One of those places open until the wee hours of the morning and drawing the kind of crowd still drinking at at that time. One night she was thrown behind the bar when the bartender was too inebriated himself to work, and she’s been tending better bars ever since. She worked at a few Italian places and then ended up at the beloved Hatian restaurant Tap Tap, on South Beach. 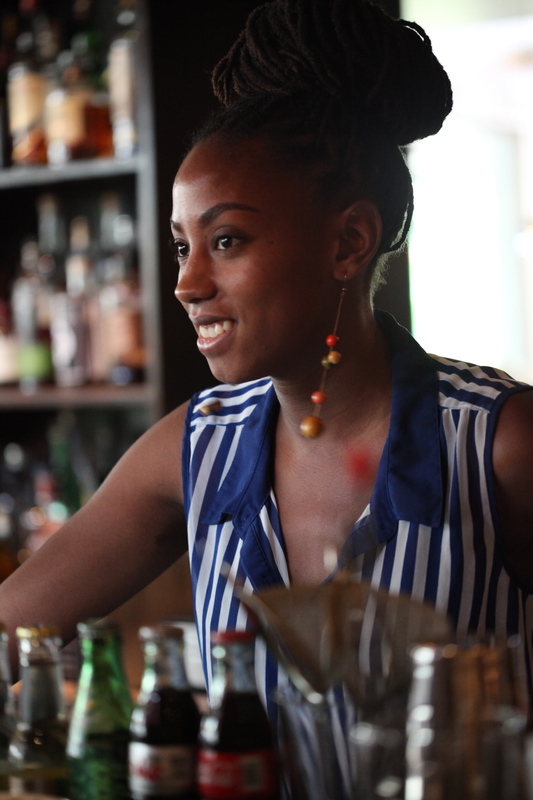 Her first martini, Chalè, means hot in Creole, is an ode to this cultural institution. From Caribbean influence to California love, Like Whiskey for Chocolate is all about old Hollywood, a twist on the classic 1920s scotch-based cocktail Blood in the Sand named for Rudolph Valentino‘s 1922 bullfighter movie Blood and Sand. Brittney’s version combines Compass Box Orangerie, Solerno Blood Orange Liqueur, Sweet Vermouth, Cherry Heering, orange juice, and finishes with Bittermens Xocolatl Mole bitters, an ode to her Mexican Godmother. Very different drinks with a common thread, a genuine expression of her past. We’re thrilled Brittney has landed in Genuineland and can’t wait to see her shine at our home on the Beach. See you at the Raleigh (1775 Collins Avenue) from 7:00 to 9:00 p.m. tomorrow in the Martini Bar, and please also visit our events page, newly updated to the beginning of October with activities both home and away. Cheers.